"The biotech industry is a complex, rapidly evolving, and critical industry. The industry holds great commercial and societal promise, but it is also filled with hype, confusion, and risks. Bergeron and Chan do a remarkable job of providing a sweeping insightful, and probing assessment of the current state and likely evolution of this global industry. This book is essential reading for the executive who desires a thorough understanding of this business and its potential." --John P. Glasser, Vice President and Chief Information Offers, Partners Healthcare System, Inc.
"Bergeron and Chan have done a marvelous job integrating many different perspectives to give the reader a coherent road map of the biotech industry for the next decade. This powerful book is anchored by numerous relevant examples that create a framework which any life sciences professional needs to understand. Of particular note is the compelling assessment of the IT industry and its impact on the life sciences as these industries converge." --Michael A. Greeley, Managing General Partner, IDG Ventures. 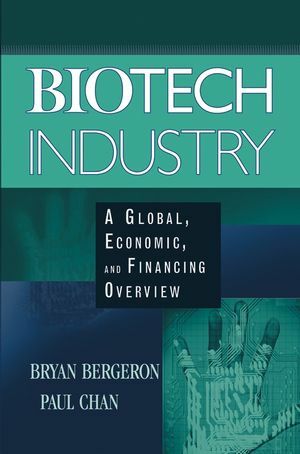 Biotech Industry: A Global, Economic, and Financing Overview provides a thorough look at the current state of the biotechnology industry, including where major research is being conducted, where it's being applied, and where money and intellectual capital are flowing. Written by a renowned business columnist and an entrepreneurial scientist in the biotech area, this unique book gives Eos and other senior-level managers an understanding of Asia's pivotal role in the worldwide success of biotechnology commercialization, as well as insight into the biotech market over the next decade. Bryan Bergeron is the author of twelve books, including Essentials of Shared Services, Essentials of Knowledge Management, and Business Expectations: Are You Using Technology to its Fullest? (all published by Wiley). He also serves as editor in chief of e.MD and technical editor of Postgraduate Medicine, is on the editorial boards of Healthcare Informatics and Perspectives in Biology and Medicine, and is a columnist for WebMD. He teaches technology and business courses at Harvard Medical School and MIT. Paul Chan is a columnist specializing in technology finance, value-based management, and private equity for Asia’s leading business newspaper, Business Times, where he currently heads the new media unit. He has had a long and successful career as an equity strategist and management consultant, and he has advised a gamut of global institutional investors. He also has directed equity research at some of Asia’s largest brokerage houses.